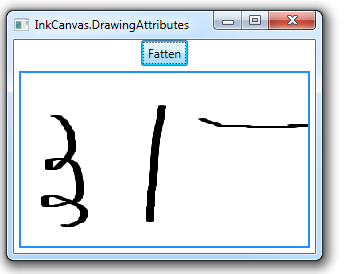 You can change the drawing attributes for new strokes added to an InkCanvas by setting the DefaultDrawingAttributes property. 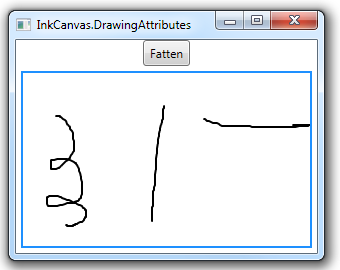 You can also change the drawing attributes of strokes already present in the InkCanvas. 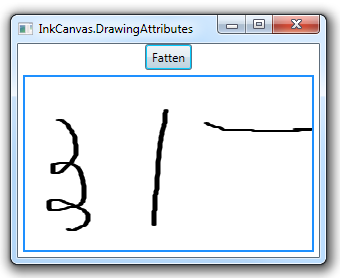 Existing strokes are stored in the Strokes property of the InkCanvas, which is of type StrokeCollection (in System.Windows.Ink). This collection contains instances of Stroke objects, each of which has a DrawingAttributes property, which references an instance of the DrawingAttributes class. In the example below, we can click on the Fatten button to thicken existing strokes. Here’s the code for the Button.Click event, which increases the Width of each Stroke already on the InkCanvas.